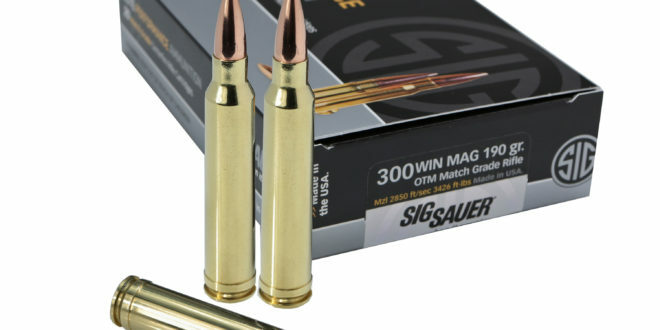 SIG SAUER Introduces 300 Win Mag (.300 Winchester Magnum) Match Grade Elite Performance Ammunition for Your .300WM Tactical AR Rifle/Carbine! | DefenseReview.com (DR): An online tactical technology and military defense technology magazine with particular focus on the latest and greatest tactical firearms news (tactical gun news), tactical gear news and tactical shooting news. 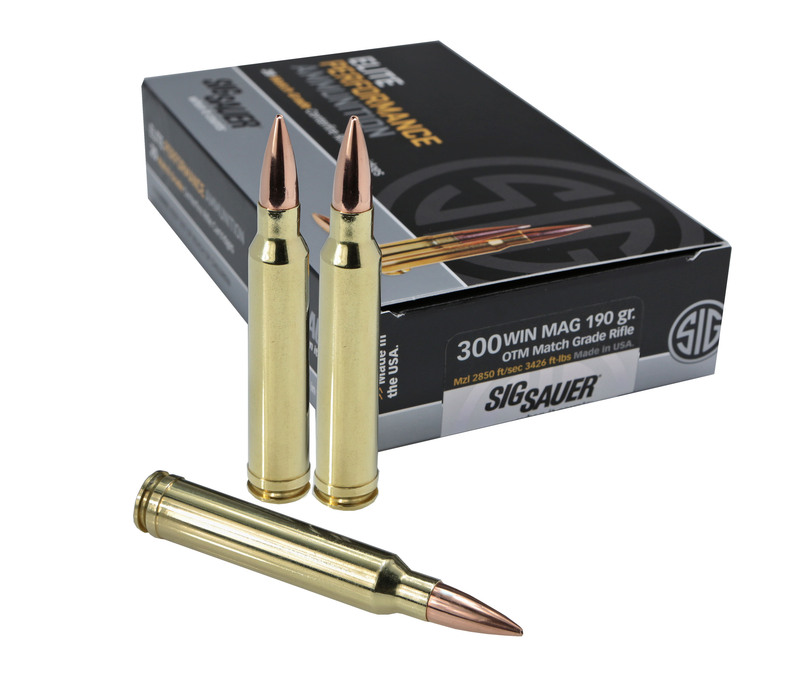 SIG SAUER Introduces 300 Win Mag (.300 Winchester Magnum) Match Grade Elite Performance Ammunition for Your .300WM Tactical AR Rifle/Carbine! Sig Sauer just announced the introduction of SIG SAUER .300 Win Mag (.300 Winchester Magnum, or .300WM) Match Grade Elite Performance Ammunition, which will come as a very welcome surprise to owners of .300WM tactical AR rifle/carbines like the Patriot Ordnance Factory POF P-300 (also written P300) and NEMO Arms Omen Recon, which DefenseReview has written about (and you should read about). 300WM tactical AR’s have been getting fairly popular in the last few years, and will most likely only increase in popularity in the years to come, as both the cartridge and gun platforms appear to be excellent. Oh, and there are some great .30-caliber cans out there now, too, like the Dead Air Arment DAA Sandman-S and Sandman-L .30-Caliber/Multi-Caliber Silencer/Sound Suppressor Systems. It’s a brave new .30-cal world out there, so soak it up. “Newington, NH (January 2, 2017) – SIG SAUER, Inc. continues to expand its Match Grade Elite Performance Ammunition line for rifles with the addition of 300 Win Mag Open Tip Match (OTM) rounds. Featuring a 190gr Sierra MatchKing® bullet, this new 300 Win Mag load has a muzzle velocity of 2,850 fps and muzzle energy of 3,426 ft-lbs. Engineered to excel in today’s precision rifles, SIG SAUER Match Grade Elite Performance Ammunition features a temperature-stable propellant that delivers consistent muzzle velocity in all weather conditions. Premium-quality primers ensure minimum velocity variations, and the shell case metallurgy is optimized in the SIG Match Grade OTM cartridge to yield consistent bullet retention round to round. All SIG SAUER rifle ammunition is precision loaded on state-of-the-art equipment that is 100% electromechanically monitored to ensure geometric conformity and charge weight consistency. “The exceptional quality of our SIG SAUER Match Grade loads makes this line a top choice for professional, competition and recreational shooters alike,” said Dan Powers, president of the SIG SAUER Ammunition Division. Getting Back to Basics: Combat/Tactical Shooting and Gunfighting with Pistol, Carbine/SBR and Shotgun! Next: SIG SAUER P320 CO2-Powered Advanced Sport Pellet (ASP) .177-Caliber Air Pistol!